Like a lot of people obsessed with great food and wine, these days I pretty much photograph everything I eat and drink. When it comes to wine this used to be so I could have a record of anything that I really enjoyed. I always found it very frustrating when I liked a great bottle of wine but perhaps as a result of over enjoyment during the course of evening I was then unable the recall the name of the wine. Not only does this makes it hard to actually learn anything but perhaps worse it means that you can't actually go to the effort to source more of that wine for future enjoyment. A by product of this practice is that I usually have a little stash of empty bottles that are not to be thrown out until photographed and I also have a pile of photos of wine bottles that I dont know what to do with! As a solution to the second problem I thought I'd start posting about some of the Pinot that we have enjoyed over the past few months. 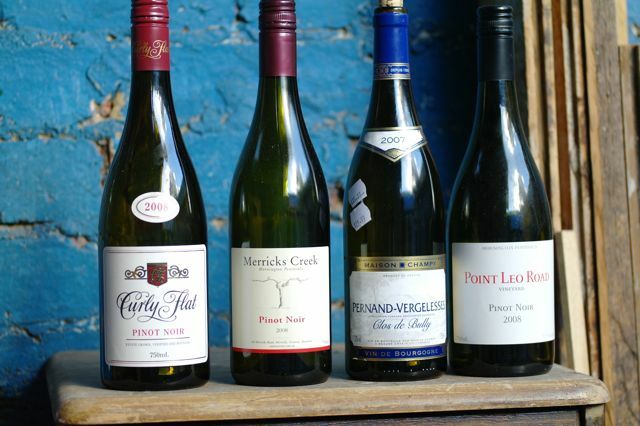 Tasting wine is a lot of fun but its also quite laborious and requires a lot of concentration. A lot of the time I just like to enjoy drinking it and mostly I'm just happy to classify each wine as great, good or OK. I do however take special note of those cheaper wines that drink really well because these are often the ones that I stock up on for enjoyment with visiting friends. This first group are some really lovely Pinots, the two on the right are both around around the $50 mark give or take a few dollars and as you would expect they both drink very well. 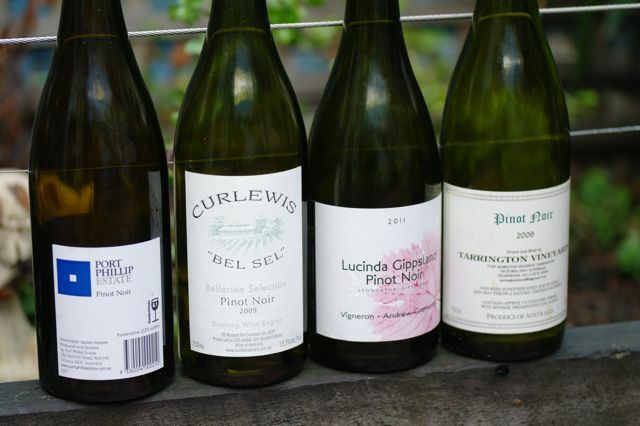 Both are from fine Victorian Pinot producers, you really can't go wrong with any of the Pinot from these labels. It's too hard to pick which of these was my favourite so I'll just cop out and say they are both excellent. The 2004 Savingy Les Beaune Aux Fourches Village was a particularly nice surprise as it was very well priced at less than $40 which I reckon is great value for a wine nearly 8 years old from the other side of the world. 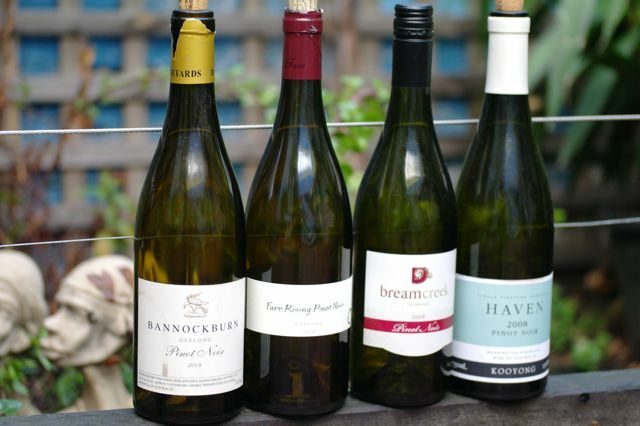 The next group also contains some delicious Pinot but of this lot the Bannockburn was the best and also the most expensive. The 2008 Kooyong Haven from Sandro Mosele is a great Victorian Pinot as is his 2009 Estate Pinot pictured above although the Haven has a lot more depth and fine qualities to ponder. I felt the Bream Creek was worthy of special mention as it is very reasonably priced at $30 and drinks at a quality of a more expensive wine. This multi dimensional Tasmanian Pinot would definitely be worth cellaring for a few years to see how it developed. Another group of excellent Pinot. Curly Flat probably doesn't need any explanation, they're just one of those great producers that seem like they can do no wrong. Merrick's Creek is a new producer to me and one that I will be exploring further in the future. Lots of great qualities in this Pinot, like a number of other wines in this post it's a shame that this isn't more widely available. The Point Leo also falls into the delicious but hard to find category. It's a bit cheaper at around $40 from memory and definitely worth checking out. I tend to live a bit hand to mouth when it comes to wine, meaning that I'm not the best at cellaring wine. I also don't like drinking the same wine too often as there is so much out there to try so it's important to me to be able to find interesting wine when I need it without too much hassle. I'm not a huge fan of chain wine stores and will always try and get to a boutique supplier when possible as they usually have a much more interesting range of local wine that they know a bit about. I'm often asked by the wine store staff, "Can I help you with anything?" to which my response is usually "Have you tried this?" they then respond "No" which then sadly answers the initial question. What I'm getting to is a bit of a justification of the numerous Maison Champy wines in this post, all of which were quite good for the record. These were all bought from the Chinatown Vintage Cellars at short notice when I didn't have time to venture further afield. 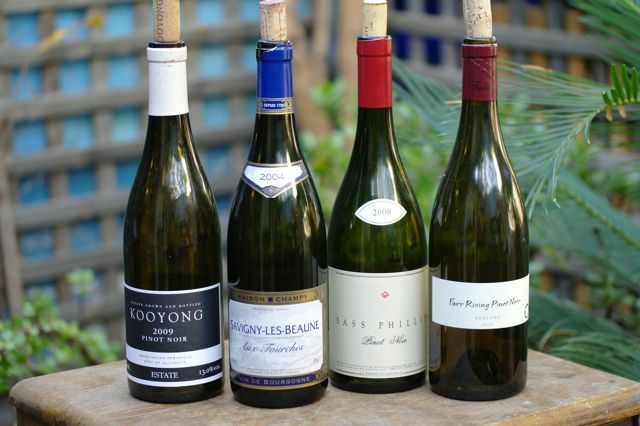 I reckon $30 or $40 for a Village Burgundy is worth a look and while none of these were standouts they all had interesting qualities that made for enjoyable drinking. 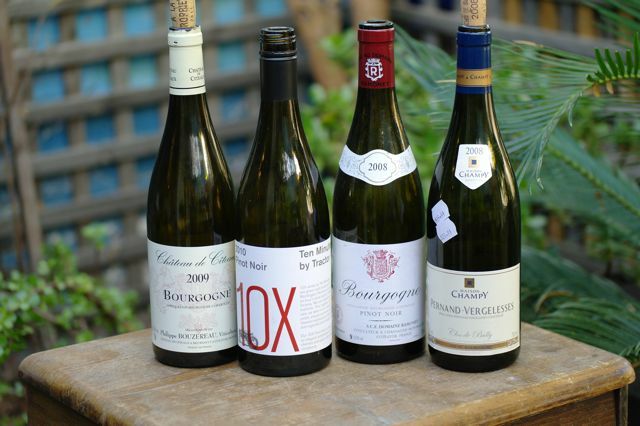 These are three great Burgundies and an equally great Mornington Pinot. 10 Minutes by Tractor is another label that isn't the easiest to find but it's certainly worth seeking out. They also have a few more expensive Pinots that are on my must drink list. All of the Burgundies were interesting wines that made for enjoyable drinking but none of them excited me in any great way. I do have to admit that my tastes have been very strongly influenced toward a preference for Victorian Pinot. Maybe this is a good thing, maybe not. This is a bunch of quaffers that I thought worth including. 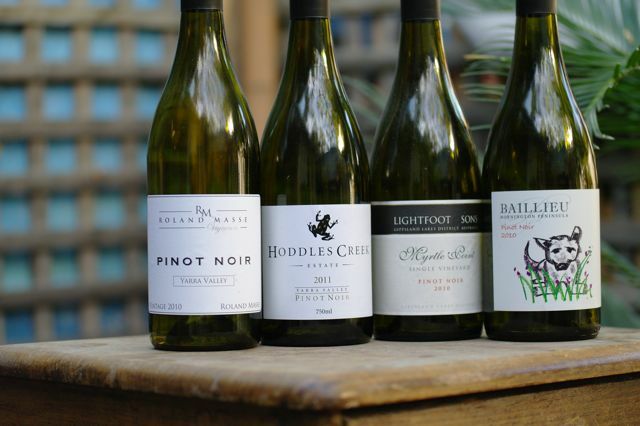 The Hoddles Creek is a very easy drinking non objectionable young Pinot at a great price. There are a few of these well made young Pinots out there and most of them are very well priced at under the $20 mark. It would be curious to see how well they age and I will be putting a few away for as long as possible to see for myself. I also love Gippsland Pinot and will pretty much try anything from that region so when I spotted the Lightfoot and Son I grabbed a bottle and wasn't disappointed. It wasn't huge but there was a enough forest floor funkiness to give my taste buds a little tickle. The first standout from this group is the Curlews Bel Sel from the Bellarine Peninsula. Well priced with a bit more complexity and tannin than some of the other Pinots in its price bracket it has a lot to offer. The Lucinda Creek is another well made young pinot with a lot of fruit in the same vein as the Hoddles Creek. There isn't a huge punch of of the funk that I typically expect from a Gippsland Pinot but its just such lovely smooth tipple with well balanced acid and tannin especially for one so young that I had to go back and grab a few more bottles to put away. Sounds fantastic. I'll definitely grab a bottle if I come across it.